Royal icing is a holiday must, both for frosting Christmas cookies and licking straight from the spoon. It’s easy, requires just egg whites and sugar, and may make a pro decorator out of you. Although royal icing is traditionally made by beating egg whites and confectioner’s sugar together until a thick, smooth, white paste is formed, you can instead opt to use dried egg white substitute. It’s available in most supermarkets and is easier and safer to use than fresh raw egg whites. We include instructions on how to use this in the recipe below. 1. Regardless of whether you’re using fresh egg whites or powdered egg whites, combine the egg whites, sugar, and water, if using, in a large bowl, starting with the liquids first. Whisk or beat for about 5 minutes if using an electric beater or whisk, longer if using a wooden spoon. Whisk slowly to start with to avoid clouds of confectioners’ sugar covering you and your kitchen. Continue whisking until the ingredients form a thick, smooth paste that is bright white in color and has the consistency of toothpaste, about 10 minutes if making it by hand. Remember that making icing is not an exact science. We often end up adding a little more water or confectioners’ sugar to get the icing to exactly the right consistency. 2. You really need to use royal icing on the day that it’s made. If you’re not using the icing immediately, cover the bowl with plastic wrap and refrigerate it for up to a few hours or, if you need, it can be stored in the fridge in piping bags or squeezy bottles. Keep in mind that the icing tends to separate a little and become less easy to handle after standing for more than just a few hours. 3. Depending on the type of cookie decorating you intend to do, you may want to take your royal icing to the next level and make piping and flooding icing. Piping icing is smooth and thick, a bit like the texture of toothpaste. This icing is used for adding fine detail and decoration, as on gingerbread cookies, and for piping borders, which form little “walls” around the areas of the cookie that you want to fill with the flooding icing, as on Hanukkah cookies. It has to be just soft enough to squeeze out of the piping bag, but also thick enough to hold its shape perfectly. To make it, you may need to beat just a little extra confectioners’ sugar or a few drops of water into your royal icing to achieve the right consistency for piping icing. If you don’t need to flood your cookies, just use the royal icing as-is or, if you wish to tint it first, go to step 4. Flooding icing is glossy and almost pourable. This icing is squeezed onto cookies to flood areas where a shiny, smooth effect is required. It’s well worth investing in a few small squeeze bottles to dispense this icing from; with their screw-on nozzles, they are perfect for directing the flow of flooding icing to exactly where it should be. To make it, gradually add enough water, a few drops at a time, stirring constantly, until you have a smooth, just pourable mixture that has roughly the same consistency, maybe a little thicker, as heavy cream. Making multiple colors of royal icing couldn’t be easier. First, figure out how many colors of icing you want and then divvy up your royal icing into that number of small bowls, pots, teacups, mugs, etc. If using gel colors, use the tip of a toothpick to add a tiny amount of the gel to the icing, stirring it until it is totally mixed in and you see the resulting color. Slowly add more gel, stirring well between additions, until the color has reached the desired shade. Remember, when coloring icing you can always add more color, but you can’t take it away. If using liquid food coloring, add the coloring one drop at a time to the icing, stirring it into the icing until it is totally mixed in and you see the resulting color. Slowly add more coloring, one drop at a time, stirring well between additions, until the color has reached the desired shade. Remember, when coloring icing you can always add more color, but you can’t take it away. You may need to beat in a little extra confectioners’ sugar if the liquid color begins to thin down your icing. When you’ve finished, cover the surface of the icing with plastic wrap and chill each bowl as you make it until you have all the colors you need. 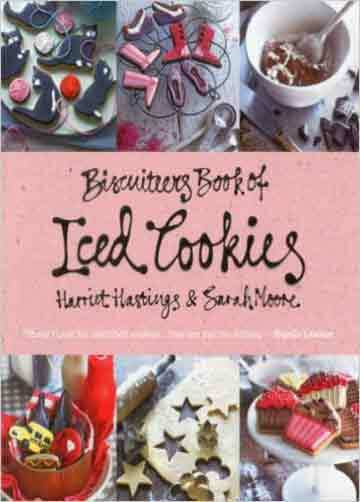 Royal Icing Recipe © 2011 Harriet Hastings | Sarah Moore. Photo © 2011 Katie Hammond. All rights reserved. All recipes and photos used with permission of the publisher. Well Ruthie, you have me stumped. I’ve always heard of flood icing as more of a technique to fill in outlined areas. Perhaps you could send us a picture? It’s transluscent and thin enough to still see the cake through. It looks gorgeous. The book was published in German, so all European stuff, but I bought the U.S. version put out by Crown? They bought U.S. rights to a lot of foreign cookbooks and repubbed them in English. I want to say it was “The Art of Baking” but I could be way off base. If I find anything enlightening, I’ll email you guys. Thanks, Beth.